As the sort of designer that spends days tap-tap-tapping at her laptop, I don't get (take) enough opportunities to actually MAKE art, which is why it is always a pleasure (and honor) to join the outstanding artist/parents at Chantilly Montessori School in our annual Gallery Crawl project. Fifteen creative parents with experience in various disciplines each work with a classroom community for six week to generate an art project and present it at this group show, a lively reception accompanied by live performance of the Plaza Family Band. 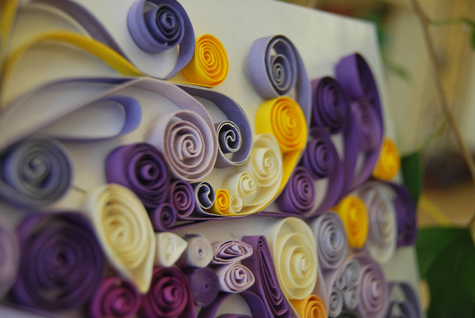 For my project this year, I worked with Upper Elementary teachers Sarah Gayde and Liz Weber and their 4th and 5th grade students on a modern interpretation of the Renaissance-era art of Quilling. We studied current quilling artists and began curling 1/4" strands of paper into tiny coils that would become a series of individual butterflies and a 24" iteration of the school logo. We were beyond excited to see our project take shape and I was continually floored by the creativity of these kids!